Water is a wonderful play resource and here at Victoria Park Nursery School & Family Hub we have created a space in which children can explore, investigate. Playing with water enhances a child’s physical, cognitive and social skills. It also increases awareness of scientific and mathematical concepts and is a calming activity that can be played solo or in a group. 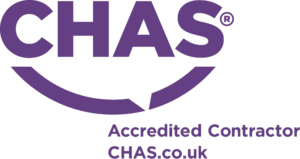 Here are some photos from the Grand Opening by Richard Benyon MP. 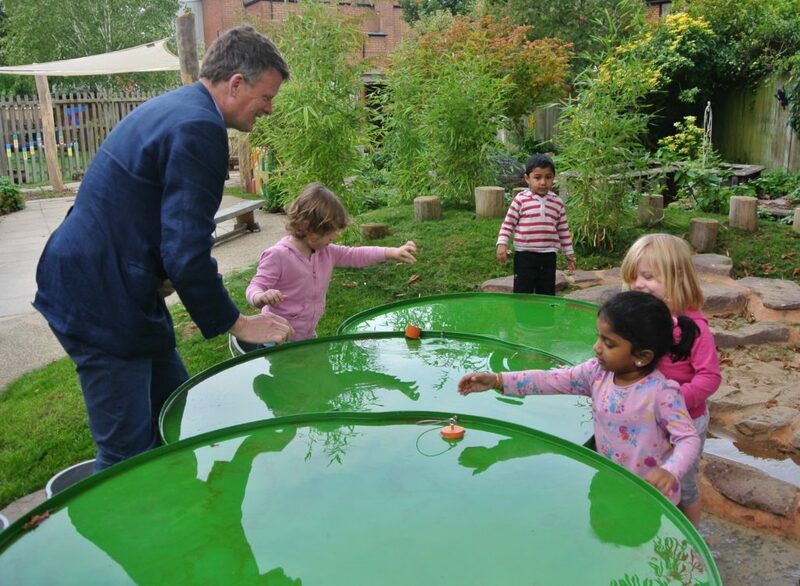 The wide, low lily pad tables are filled with water to form pools that can be used to play with utensils and toys. The tables have drain holes with plugs which allow children to control the flow of water from one table to the next finally emptying into a river bed of boulders where gravity gently takes the water to a shallow bowl. 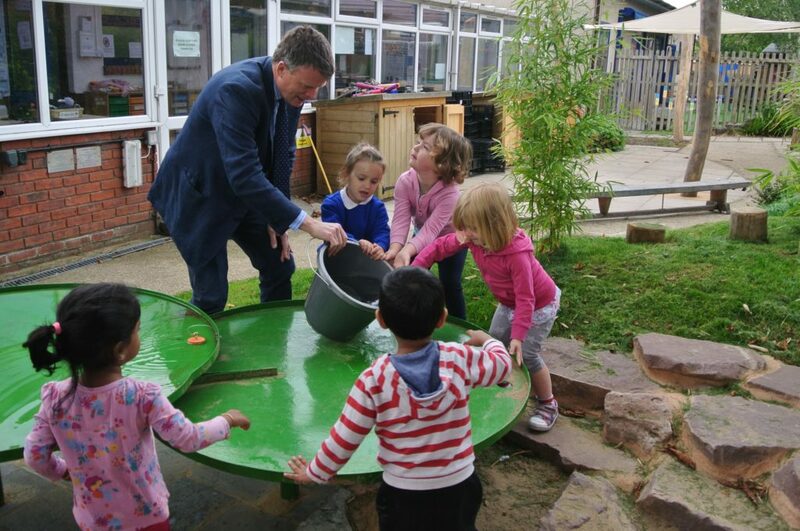 Children and adults can organise how much water is used by filling buckets or other containers from a near by tap, the water that collects on the bowl can be swept out at the end of the play session. The existing bank has been covered with new turf and large bamboos planted to make the space feel more wild and inviting. 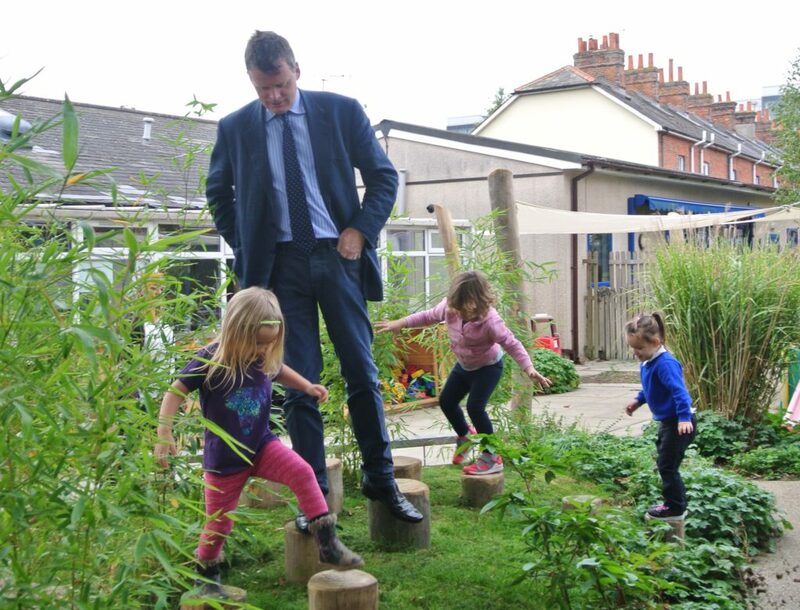 Challenging stepping logs set into the bank creates a secret route for the children to explore. Next to the river bed and edged with boulders and logs is a sand pit to introduce the creativeness of messy play. Combining water and sand allows children to explore what happens to solids and liquids when they are mixed.